It's been 9 years today since she passed. I've been thinking about her for days now thinking about the 'what ifs'. I know I can't dwell on those 'what ifs' but I can't help it everytime I think about her [and my Tatang]... which is more often than I care to admit. I've been told by a lot of my relatives, especially her siblings, and friends that I look like her. I'd like to think so too. But as the years go by, I've realized that our similarities don't end there. I am my mother in so many ways. I'm not sure if she'll be proud about that but I am certainly happy to be just like her in more ways than one. I know one day I'll see her again...but I wish she's still around so when I am at my weakest I can still run to her just like when I was a little girl. Oh mommy, you definitely looked like her! And I am sure your a good mom too. Take care as always! Jules, you look like more of your mom :-)...am sure your mom is happy! ganda naman pala ng nanay mo ano. kaya ka nga maganda manang mana sa nanay! of course mabait din si Miss J, I can tell kahit hindi pa tayo nag meet in person. 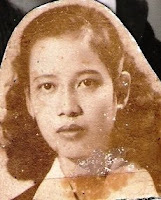 you do look like your nanay tuks. nine years is a long time, but as they say one does not stop thinking of their parent once they are gone. here late, kasi late ulit gumising, ano pa nga ba ang bago haha. Ganda naman ni Mother, J! Kaya ka super beauty kasi parehong good looking ang pinanggalingan mo. Oh.. thinking of nanays really makes us a little bit sentimental. More so if our Nanay is that loving and caring. Am sure those good mothers are happily resting now. even at your lowest, you can still run to your nanay. just recall and remember the days that are the happiest moment that you two have shared together. somewhere, you will see her wisdom, the comfort that she will give as if she were still around and even life's lessons that she used to impart to you. the reason for this J, is because of that love that you have for her and that love that you felt when you were in her arms. just use that love so you can run to her everytime theres a need to. kumusta na my friend? hopping around here today to catch up with whats new... hope i can kickstart my writing again. really miss it so much. kaya lang, when i sit in front of the pc thinking what to write, wala naman pumapasok sa ulo ko. someday soon, i hope, when everything is running smoothly na. ciao!